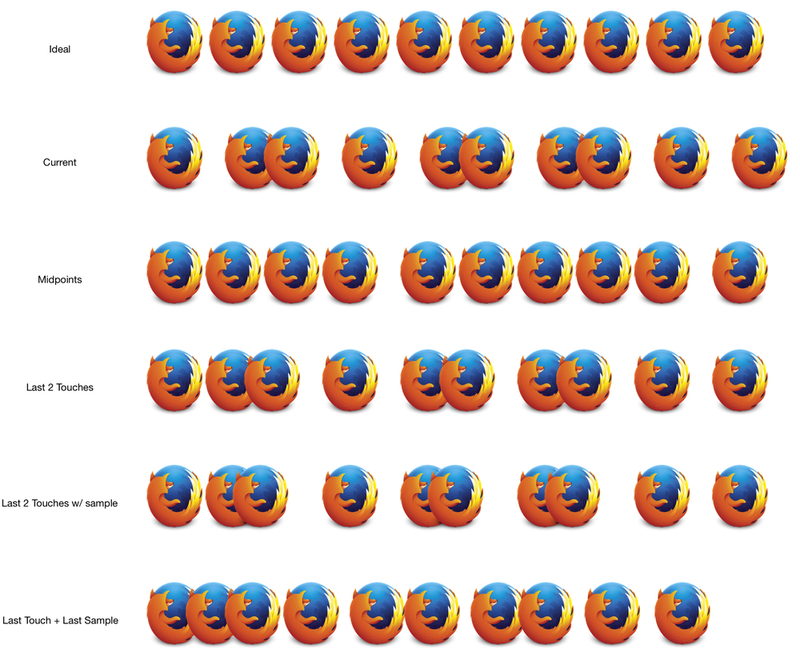 I just wanted to see what Chrome was doing for it's rendering compared to Firefox, especially after Slimming Paint. Chrome has three main processes that interact to render a web page. The Renderer process - This is what you think of when you hear about multi-process Chrome. Each tab has it's own renderer process. The GPU process - This is a sandboxed GPU environment where Chrome issues all hardware accelerated GPU calls to composite. The UI process - One process that renders the UI such as the tabs at the top of the browser. On the main thread of the renderer process, rendering starts during parsing of the HTML, which creates a DOM tree. These DOM nodes mostly get turned into LayoutObjects, which know how to paint themselves. These get layerized into multiple different kinds of layers you can read up on here. GraphicsLayers paint the items off the LayoutObjects into a blink::Display Items. When content gets painted, Chrome issues Skia draw calls to draw the content. But the content isn't actually drawn, it's recorded into an SkPicture. Most content of the display items in Chrome are wrappers around SkPictures or map to the Skia API. The generated blink::DisplayList is then translated to Chrome Compositor (cc) Display Lists, which are roughly the same, but no longer contain references to the LayoutObjects. Yes, there are two display lists. This cc::display list is shipped to the compositor thread of the renderer process. Using a work queue, multiple compositor threads replay the recorded Skia drawing commands to draw to 256x256 tiles. The resulting tiles are then composited with hardware acceleration in the GPU process. The GPU process does the tile GPU upload. The index here where the item exists in the display list. The client is what the actual display item is there to paint, and is a reference to a LayoutObject. The first LayoutView #document is just the empty white background we have in a simple page. The "type" is the only unique thing about the blink display item, which is which phase these items should be painted. Painting in this context means going through the Layout tree and generating blink::DisplayItems, which are wrappers around an SkPicture. An SkPicture is just a recording of draw commands such as "draw text" or "draw image" which map to the Skia API. Thus unlike Gecko, blink doesn't draw from the display items. Instead, display items are the result of a recording of draw commands issued by painting items recursively down the layout tree. Once we have the blink display items, these are translated into cc display items, which are also just wrappers around the recorded SkPicture. Once the translation is done, the main thread then notifies the compositor thread that there is some work to do. The compositor thread actually rasterizes items on the screen based on 256x256 tiles. The compositor thread itself also doesn't actually replay the SkPicture draw commands, but instead sets up a work queue with items to draw. Then multiple compositor tile worker threads take an work item and replay the SkPicture draw calls onto an SkCanvas. In our example, we have 3 display items but all items are painted onto one SkCanvas. Once the tile worker threads have finished rasterizing the cc::DisplayItems, Chrome can start compositing everything together. Chrome by default on Windows doesn't use GPU acceleration to rasterize content, but it does for compositing. Remember the GPU process at the beginning though? All GPU commands must be executed in the GPU process so that when the GPU driver does something bad (and it happens too often), it doesn't take down the browser. To do this, Chrome uses shared memory with the GPU process. The GPU process reads the final rasterized image and uploads it to the GPU. Then the GPU process issues GL draw calls to draw quads, which is just the rectangle containing the final bitmap image for the tile. Finally, Chrome's ubercompositor composites all the images together with the browser's UI. I've been learning quite a bit about WebRender, a new research rendering engine for web content. At its core, WebRender philosophically uses the GPU to draw web content instead of the CPU which has traditionally been used. Currently Firefox uses an immediate mode API to draw content (Note immediate / retained mode are very broad and overloaded terms). An immediate mode API usually requires a context object, the programmer sets different states on the context object, and then you draw things onto the screen one item at a time. A retained mode API, which WebRender is using, is slightly different. Instead, rendering is done in two passes. First, you set up and upload data to the GPU and issue draw calls to the GPU to render, but nothing is actually drawn yet. Next, you tell the GPU "draw everything I told you about". This is a fundamentally different way to think about programming, which has actually been wrecking my brain the past couple of days. WebRender itself takes as an input display items and outputs pixels to the screen. It takes a complete description of the layout up front and analyzes how best to optimize the commands to send to the GPU. Let's take a high level overview of what's going on with WebRender. Servo performs layout, which generates Display Items. Display items are just descriptions of what to render like "Text" and "Images". WebRender takes these display items and converts them to a Primitive type, which is a 1:1 representation from layout's Display Items. These could technically be the same as the Display Items in (1), but sometimes it's easier to deal with a different data structure. WebRender assigns these Primitives to Layers, which are not the same concept as layers in Gecko. Instead Layers here are Stacking Contexts. We then generate screen tiles, which at the moment are uniform 64x64 device pixel tiles. Assign the Primitives in each Layer to it's appropriate screen tile. 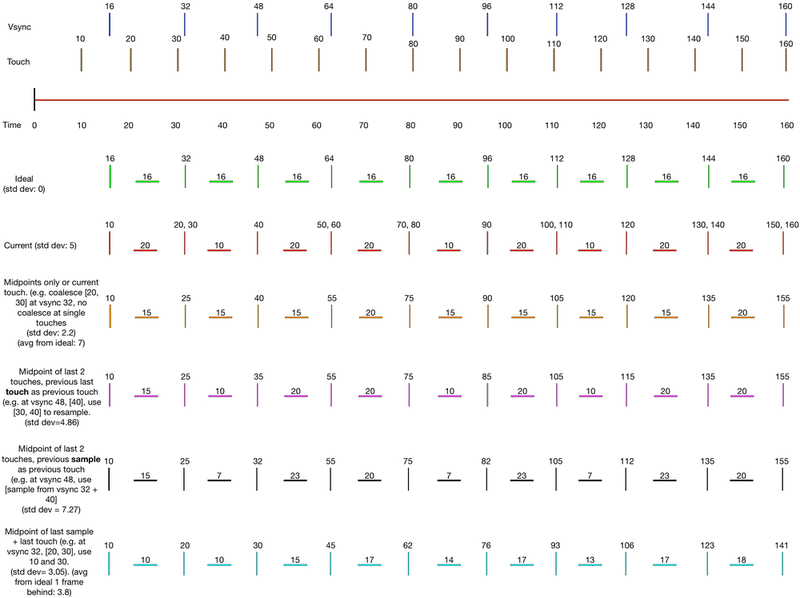 Break down the Primitives per tile into Packed Primitives. Packed Primitives are the same Primitive information broken down into GPU uploadable data. Update the list of GPU resources that need to be updated. Notify the Compositor thread (which is the main thread), we're ready to render. The main thread / Compositor issues OpenGL draw commands and updates GPU resources based on the information from (7). All actual GPU interactions occur on the main thread. Let's walk through what is actually happening for a small test case. We have three SolidColor rects along with one Image item within one Stacking Context. Let's focus only on the Image display item for now. We start by iterating over each Display Item given to us by layout and converting the Display Item to a Primitive type. Adding an image converts the Display Item information to the ImagePrimitive. Next, we assign these Primitives to Layers, which are 1:1 to Stacking Contexts. From the display list dump, we only have one Stacking Context so we'll only have one Layer in this case. However, the wrinkle here is that we do this based on tiles. WebRender splits the screen into uniform 64x64 tiles. For each tile, we check if the Layer intersects the tile. If so, for every Primitive in the layer, we check whether a Primitive intersects the tile, and so store which Primitives exist on the tile. This makes it easier for every tile to know what it needs to actually render. Once we have all the Primitives for each tile, we go through each tile and create the PackedPrimitive that's local to each tile. Let's assume for simplicity that device pixels are equal to CSS pixels, e.g. 1px in CSS specification means 1 physical pixel on the monitor (which doesn't always happen, but it's easier for this). For example, since this test case case is 100x50, this test case will span two 64x64 tiles horizontally and 1 tile vertically for 2 total. The PackedPrimitive has information about which tile it's assigned to which will be used later in the shader. What's critical here is that WebRender will upload the same PackedImagePrimitive N number of tiles times, with really the only difference being the tile id. In addition, it's uploading some data called st0 and st1. These are references to the top left and bottom right coordinates of the image in a Texture Atlas. A Texture Atlas is one giant image composed of other smaller images. Instead of creating a separate GPU buffer for just the image, WebRender uses one giant texture with parts of the Texture Atlas used for individual images. The vertex shader will reference these coordinates later as sampling coordinates to render the actual image from the Texture Atlas. The list of Packed Primitives that are of the same type to render are called batches. Next, WebRender does some notetaking on what needs to be rendered and notifies the Compositor thread, which is really the main thread of the process, that we need to update the screen. ProTip: Doing GPU operations not on the main thread means you're going to have a bad time. Once the compositor is notified, WebRender finally starts doing actual graphics things with OpenGL! The biggest brain wreck for me was realizing that with GPUs, you issue commands to the GPUs but you don't know when the GPU will actually execute the commands. In reality, it means you're queuing up work to do, and it will execute sometime in the future. Second, with shaders, you map vertices to different points on a [0..1] axis and transform them onto the screen. This makes GPUs very hard to debug as you can't actually single step through your shader to see what is going on. // gl_InstanceID is auto incremented due to instanced call. // This vertex's position within the CSS box. // Get the tile's position in relation to the CSS box. // vUv will contain how many times this image has wrapped around the image size. // These 3 variables are passed onto the fragment shader. // Transform the position onto the screen. Consider the tile boundary on the top right of this tile. This tile corner is some position, aPoint, within the CSS image we wanted to render, the original 100 px x 50 px image. Based on the location of aPoint, we map it to the location of the actual image in the Texture Atlas. Lastly, we're at the fragment shader! If we look back at how we calculated the three variables vUv, vOffset, and vTextureSize. vTextureSize is the size of the texture within the Texture Atlas. vOffset is where the start of the image is within the Texture Atlas. vUv is the only interesting part, which calculates how many times an image should be rendered at the current tile corner. In the sample case, at tile 1 with a X offset of 64, we've rendered the image (64px - tile offset / 50 - image size) or 1.28 times. This means the image needs to wrap around and repeat again. Thus in the fragment shader, we take the fractional part of this calculation (0.28) and say this point maps to 0.28% from the left of the source image. We just mapped the tile corners to the appropriate points within the source image. The GPU does the rest and interpolates everything else in between. On a side note, the fragment shader gets called for every pixel whereas the vertex shader gets called for every vertex. Since we only supplied 6 vertices for two triangles to draw one rectangle, the vertex shader would be called 6 times. We have to do the fract() calculation in the fragment shader since the actual value vUv will be interpolated between the values we supplied in the vertex shader for vUv at the appropriate 6 indices. (e.g. if at vertex [0,0] we supplied a vUv value of 0.3 and at vertex [1, 0], we supplied a vUv value of 0.6, every call to the fragment shader for pixels between [0,0] and [1,0] will be an interpolated value between 0.3 and 0.6.). Whew that was a lot and a crazy brain dump because GPUs are confusing. There's still a bunch more to WebRender such as compositing the Stacking Contexts together when they need blending, but I haven't gotten there yet. You can also learn a bit more on Air Mozilla. Thanks very much to Glenn Watson for proofreading and explaining so many things to me. What is vsync, why vsync and why does it matter at all? Vertical synchronization occurs when the hardware display shows a new frame onto the screen. This rate is set by specific hardware, but major displays in the US occur at 60 times a second, or every 16.6 ms. This is where you hear about 60 frames per second, one frame every time the hardware display refreshes. 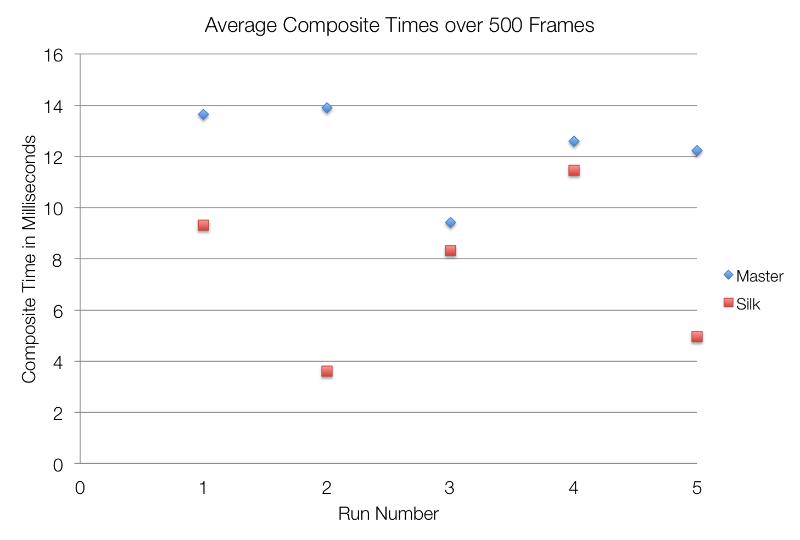 What this means in reality is that no matter how many frames are produced in software, the hardware display will still only show at most 60 unique frames per second. Currently in Firefox, we mimic 60 frames per second and therefore vsync with a software timer that schedules rendering every 16.6 ms. However, the software scheduler has two problems: (a) it's noisy and (b) can be scheduled at bad times relative to vsync. Wow! That's a lot better with a hardware timer. With hardware timers, we get a much more uniform, and therefore smoother timestamp to key animations off of. So that's problem (a), noisy timers in software versus hardware. At time 0, we start producing frames. Let's say all frames for the sake of example take a constant time of 10 ms. Our frame budget is 16.6 ms because we only have to finish producing a frame before the hardware vsync occurs. Since frame 1 is finished 6 ms before the next vsync (time t=16 ms), everything is successful and life is good. The frame is produced in time and the hardware display will be refreshed with the updated content. Now let's look at Frame 2. Since software timers are noisy, we start producing a frame 9 ms from the next vsync (time t=32). Since our frame takes 10 ms to produce, we'll actually finish producing this frame at 1 ms AFTER the next vsync. That means at vsync number 2 (t=32), there was no new frame to display, so the display still shows the previous frame. In addition, the frame just produced won't be shown until vsync 3 (t=48), because that's when hardware updates itself. This creates jank since now the display will have skipped 1 frame and try to catch up in the upcoming frames. This also produces one extra frame of latency, which is terrible for games. Vsync improves both of these problems since we get both a much more uniform timer and the maximum amount of frame budget time to produce a new frame. Now that we know what vsync is, we can finally go onto what Project Silk is and why it helps create smooth experiences in Firefox. In the ideal world, we'd be able to do all three steps within 16.6 ms, but that's not the case most of the time. Both steps (1) and (3) are on independent software timers. Thus there was no real synchronizing clock between the three steps, they are all ad-hoc. They also had no relation to vsync, so the timing of the pipeline wasn't related to when the display would actually update the screen with the content. With Silk, we replace both independent software timers with the hardware vsync timer. For our purposes, (2) isn't really affected useful but only here for completeness. Aligning the timer used to tick the refresh driver with vsync creates smoothness in a couple of ways. First, many animations are still done on the main thread, which means any animation using timestamps to set the position of an animation should be smoother. This includes requestAnimationFrame animations! The other nice thing is that we now have a very strict ordering of when rendering is kicked off. Instead of (1) and (3), which are related occurring at a synced offset, we start rendering at a specific time. With Silk, we can enable touch resampling which improves smoothness while tracking your finger. Since I've gone over what touch resampling is quite a bit, I'll leave this short. With Silk, we can finally enable it! Within the device driver on a Flame device, there's a global lock that's grabbed when close to vsync intervals. This lock can take 5-6 ms to get, greatly increasing the composite times. However, when we start a composite right after a vsync, there is little contention to grab the lock. Thus we can shave off the wait, therefore reducing composite times quite a bit. Not only do we get smoother animations, but also reduced composite times and therefore better battery life. What a nice win! With all three pieces, we now have a nice strict ordering of the rendering pipeline. We paint and send the updated content to the Compositor within 16.6 ms. At the next vsync, we composite the updated content. At the vsync after that, the frame should have gone through the rendering pipeline and will be displayed on the screen. Keeping this order reduces jank because we reduce the chances that the timers schedule each step at a bad time. For example, in the current implementation without silk, the best case would be that a frame could be painted and composited within a single 16.6 ms frame, which is great. However, if the next frame takes 2 frames instead, we just created extra jank even though no stage in the pipeline was really slow. Aligning the whole pipeline to create a strict ordering reduces the chances that we mis-schedule a frame. Here's a picture of the rendering pipeline without Silk. We have Composites (3) on the bottom of this profile. We have painting (1) in the middle, where you see Styles, Reflow, Displaylist and Rasterize. We have Vsync, which are those small little orange boxes at the top. Finally we have Layer Transactions (2) at the bottom. First, when we start Compositing and painting are not aligned, so animations will be at different positions depending if they are on the main thread or compositor thread. Second, we see long composites because the compositor is waiting on a global lock in the device driver. Lastly, it's rather difficult to read any ordering or see if there is a problem without deep knowledge of why / when things should be happening. Here is a picture of the same pipeline with Silk. Composites are a little shorter, and the whole pipeline only starts at vsync intervals. Composite times are reduced because we start composites exactly at vsync intervals. There is a clear ordering of when things should happen and both composites and painting are keyed off the same timestamp, ensuring smoother animations. Finally, there is a clear indicator that as long as everything finishes before the next Vsync, things will be smooth. Overall, Silk hopes to create a smoother experience across Firefox and the web. Numerous people contributed to the project. Thanks to Jerry Shih, Boris Chou, Jeff Hwang, Mike Lee, Kartikaya Gupta, Benoit Girard, Michael Wu, Ben Turner, Milan Sreckovic for their help in making Silk happen. After digging through the internet and some advice from Jerry Shih, I looked into Google Android's touch resampling algorithm. For those interested, it is located here. Android's touch resampling algorithm is amazing and hats off to the Googler who figured it out. Android uses a combination of touch extrapolation and touch interpolation. Touch interpolation means we take two touch events and create a single touch event somewhere in the middle of the two touch events. Touch extrapolation means we take two touch events and create a single touch event somewhere ahead of the last touch event or predict where a touch event will be. Let's take a look at our standard input from both the LCD refresh display rate of 60 hz and the touchscreen refresh scan rate of 100 hz. (For those who need catching up, please read the previous post). The sample time is used to balance and determine whether touch events are extrapolated or interpolated. We only ever look at the last two real touch events, never at a sampled event. If the last touch event occurs AFTER the sample time, but BEFORE the vsync time, we interpolate. This occurs for example at time vsync t=32 ms. The sample time is time st=27 ms, but we have two touch events. One touch event at time t1=20 ms and time t2=30 ms. Since the last touch event, t2, is at 30 ms and after 27ms, we interpolate these two touch events. If the last touch event occurs BEFORE the sample time, we extrapolate touch events. For example, at vsync event t=48 ms, we have a sample time of st=43 ms. The last touch event is at time t=40 ms, which is before the sample time. We will use the last two touch events at time t1=30ms and t2=40ms to extrapolate the touch event for vsync event t=48. If there exists a touch event AFTER the sample time, not the vsync time, we interpolate the last two touches. If both touch events occur BEFORE the sample time, we extrapolate the last two touch events. Here is the general equation. The LastTouch refers to the touch ahead of the SampleTime. The FirstTouch refers to the touch before the SampleTime. We see that we have a final result of displacement d=75. That's it for interpolation. Here is the general extrapolation equation. The Last Touch refers to the most recent touch. First touch refers to the earlier touch event. We still use the last two touch events to extrapolate. Let's do one more extrapolation case at vsync time t=128 ms. Here is the work for a final displacement of d=123ms. Wow. Just wow. Outside of the first frame because we have no extra touch events, it hits the ideal case of moving a displacement of 16 pixels every 16 milliseconds for a perfect smooth scroll. It has a Frame Uniformity standard deviation of 0. What's even more amazing is that these formulas to calculate touch interpolation and extrapolation works across different touch screen refresh rates. For example, Mozilla's Flame reference device has a touch refresh rate of every 13 ms instead of every 10 ms like the Nexus 4 and it still works to create a perfect smooth scroll. Even more amazing, this algorithm accounts for touch driver noise because real devices don't send a touch event at exactly perfect 10 ms intervals, they jitter so you get touch events at 9.9ms or 10.5ms. How does it feel in real life? Since we actually extrapolate touch events, if we're scrolling, it feels more responsive since it seems to keep up with your finger better. In addition, flings feel faster making the whole system feel not necessarily smoother but more responsive. While tracking your finger, or doing a slow scroll, we get the additional benefit that scrolling feels smoother as well. In all aspects, compared to the other touch algorithms, this is superior. On fast scrolls it keeps up with your finger better than the previous sampling algorithms. On slow scrolls, it smooths out the touch events creating a smooth experience. The only downside is that if you change your fingers direction, it will be a bit more jarring if we extrapolate then change directions. However, in real life I only barelynoticed it rarely and only because I was looking for it. Overall, a very nice win.